Art Deco replica ring in platinum and diamond. 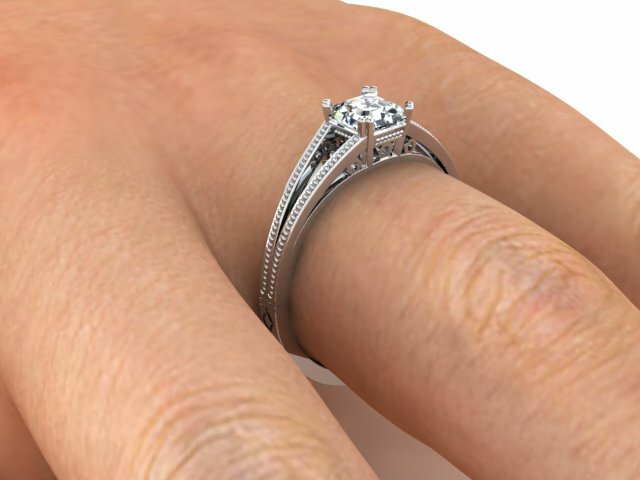 Distinctive Art Deco inspired ring design, which we created in platinum. 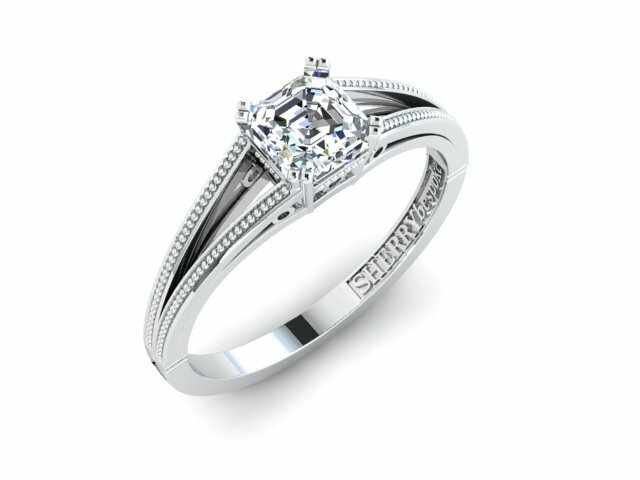 It is set with a very fine, Asscher cut diamond; a cut that catches the light well. 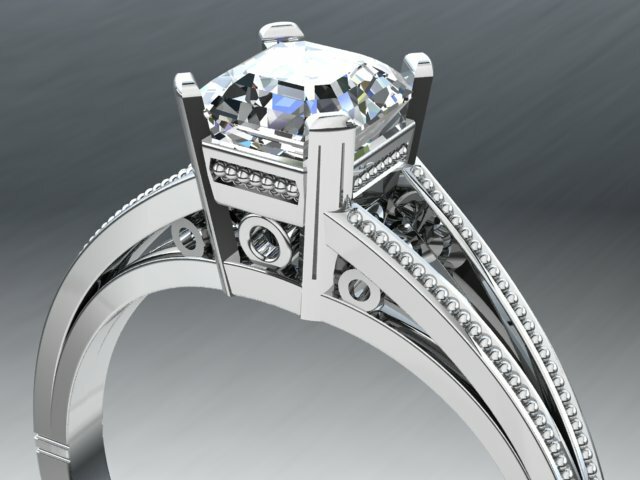 The new customer made an inquiry, asking if we could make a brand new ring, in the style of a 1930s Art Deco ring. Of course we could, so we produced a sketch and some CGIs to illustrate what could be produced. The ring was an ‘adapted’ replica ring. We tried to mimic the general character of the angular, symmetrical style of Art Deco design. But we endeavoured to improve its wearability and longevity, paying attention to the depths and thickness of the components. We decorated the ring with tiny beaded tracks. This is called milligraining and it is applied to the surface of the platinum, with a tiny revolving wheel, which is pressed and run along the desired area. The Art deco replica ring commission was a more unusual order for us. We generally create completely original, bespoke jewellery. We have our own distinctive design style. However, under certain circumstances, we are happy to make a similar pattern or replica. In the past, we have duplicated items of jewellery that have been lost or stolen. We have also recreated replacement rings, when a piece has worn out past the point of renovation. Every bespoke piece of jewellery is designed and made in our studio. Each design is our intellectual property and is protected by copyright laws. We endeavour to only ever make one item of a design. Occasionally, a variation on a theme will be asked for and if we feel that the final design will have significantly differing qualities to the original piece, then we may re-create it in its new guise.